Geoff has been training in ECKA since 1987, gaining his 1st Dan Black Belt in 1992, 2nd Dan in 1998, and 3rd Dan in 2003 (with a Grade A-). In 2010 he was awarded his 4th Dan Black Belt by ECKA and in 2016 he was awarded his 5th Dan Black Belt by WAKO GB. 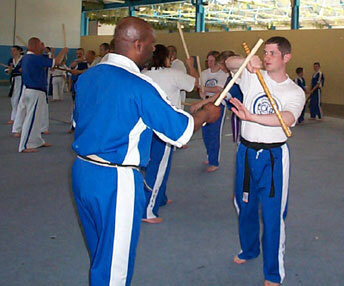 Geoff is a WAKO qualified instructor in the Milton Keynes area, who has run the Bletchley club since 1999. Geoff has been training under his instructor Sensei Dev Barrett since 1988 and has also trained with other notable instructors; Kancho Henk Kuipers, Geoff Thompson, Remy Bonjasky, Semy Schilt, Ronnie Green, Howard Brown, Ray Hoffman, Junior Anderson & Jean Frenette. Geoff has also a current clean Enhanced DBS check. Geoff became an International referee in the 2006 WPKA World Championships, refereeing and judging in the Light Continuous and Semi-contact categories, including a number of World Championship finals! 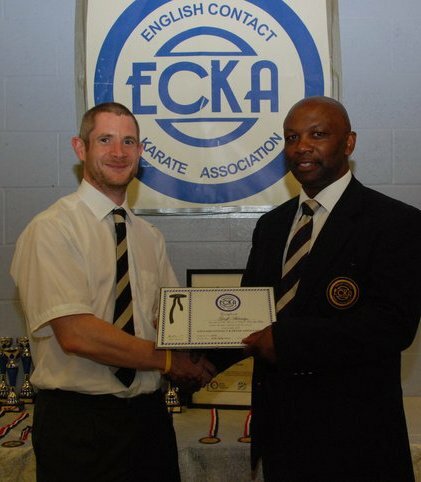 In 2008 he was awarded his ‘A’ class referee status from the ECKA. In 2013 he was qualified as WAKO Referee for Ring Sports (Full Contact, Low Kick and K1), in 2014 he was selected to represent Great Britain in the WAKO European Championships and again in 2015 in the WAKO World Championships where he earned his International Referee licence – class “B”. Geoff is an Associate Instructor with The British Combat Association and has previously trained in Jujitsu, and currently holds the grade of 6th Kyu, with the British Jujitsu Association. He also maintains the main ECKA Web site. 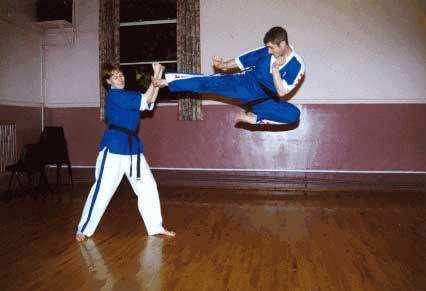 Geoff performing a flying side kick on his wife, Libby (an ECKA 3rd Dan Black Belt).